Active Motif's Low Cell ChIP-Seq Kit provides a complete ChIP-Seq workflow for chromatin preparation, immunoprecipitation and NGS library preparation from limited amounts of cells or small tissue biopsies. The assay is robust enough to work with both high abundance histone modifications and low abundance transcription factor proteins. The Next Gen DNA Library and Next Gen DNA Indexing reagents are included to generate high complexity sequencing libraries that are compatible with Illumina® platforms. ChIP-Seq is a method that has traditionally relied on using millions of cells per immunoprecipitation reaction to provide information about global changes across large populations of cells. The Low Cell ChIP-Seq Kit not only reduces sample input requirements, but it also resolves issues often associated with low-cell ChIP, including poor signal-to-noise, inefficient library amplification and high duplication rates. The Low Cell ChIP-Seq Kit contains enough reagents to perform 16 ChIP-seq reactions. To learn more about Low Cell ChIP-Seq, click on the Documents tab to download the product manual, or click on the Data, or Contents tabs below. Some of the included ChIP buffers, blockers and Protein G capture reagents may also be purchased separately. What is Low Cell Number? With Low Cell ChIP-Seq, researchers can reduce the number of cells they are studying to improve their understanding of the complexities of protein-DNA interactions to a more limited population of cells. The assay is ideal if working with limited sample amounts, hard to culture cell lines, or small tissue biopsies. The recommended cell number is the amount of cells that will be used for each chromatin preparation. The entire chromatin sample is then used in a single immunoprecipitation reaction. This differs from other ChIP assays where chromatin must be prepared from larger cell numbers and then the chromatin is diluted for use in the immunoprecipitation. Figure 1: Table of the minimum recommended cell numbers for use with Low Cell ChIP-Seq Kit. Minimum cell numbers suggested are based on target protein abundance and antibody affinity. Other factors that will influence the recommended cell number include cell type, abundance of target protein and the quality of the ChIP-Seq antibody. Below are some validated antibodies from Active Motif for use with Low Cell ChIP-Seq. Figure 2: Table of Active Motif's Low Cell ChIP-Seq validated antibodies. To determine protein abundance within your sample type, it may be necessary to evaluate expression data, research protein databases, or assay a variety of cell numbers to determine the optimal amount needed. Below is a graph of data generated using Active Motif's Histone PTM Multiplex Service. This assay evaluates up to 14 histone modifications within the same sample well. Various mouse tissues were analyzed to determine the relative abundance of histone modifications across sample types. 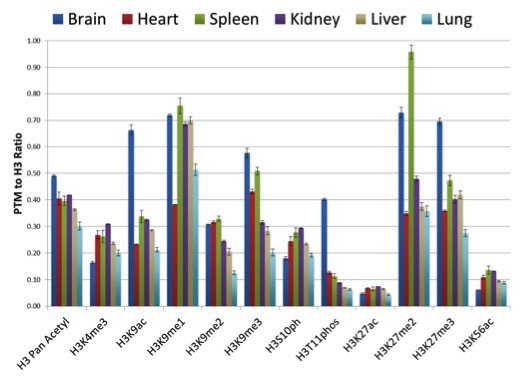 Data shows some histone modifications, such as H3K27ac and H3K56ac, display low abundance across all sample types tested. However, other modifications, such as H3K27me2 and H3K9me3, show tissue-specific differences in the levels of the histone modification. Figure 3: Histone H3 PTM Multiplex data of Histone abundance in mouse tissue.